Kanye West and co. are scheduled to appear on an upcoming episode of ‘The Cleveland Show’ this fall. 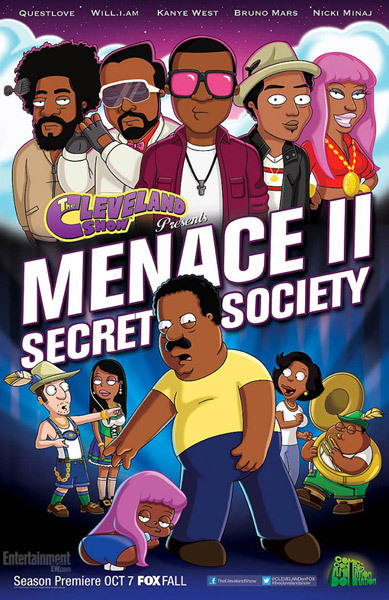 West will be joined by animated versions of ?uestlove, Nicki Minaj, Bruno Mars, and Will.i.am on the show’s special Menace II Society episode. This won’t be West’s first appearance on the show, he first appeared back in 2010. The season premiere will air on FOX on October 7. This would be awesome.I want to see Bruno,kanye,will and nicki in it.I think Bruno,kanye, will and nicki should make a song together featured in Cleveland.